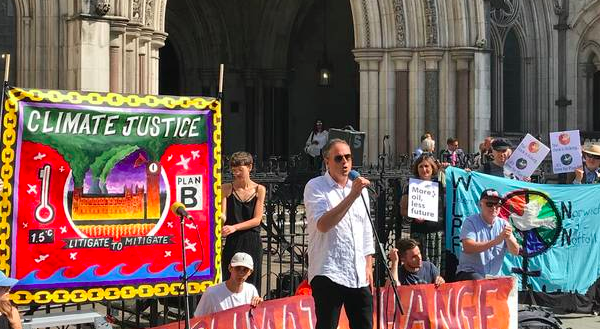 Environmental campaigners have lost their High Court challenge against the Government over its policy for tackling climate change. Charity Plan B Earth brought legal action against the Government’s stance on the 2050 carbon target, set under the Climate Change Act 2008. The charity and 11 UK citizens aged nine to 79 – including publisher Dame Carmen Callil – wanted to bring a judicial review against Business Secretary Greg Clark over the policy. But Mr Justice Supperstone rejected Plan B Earth’s case on Friday, saying it was “unarguable”. Today a U.S. District Judge threw out New York City’s lawsuit against five major energy companies alleging damages relating to climate change. Judge John Keenan wrote in his opinion that, “Global warming and solutions thereto must be addressed by the two other branches of government,” not the judiciary, according to Bloomberg. This major blow marks the third climate case to be thrown out—litigation in San Francisco and Oakland was dismissed by a federal judge last month on similar grounds. Both of these cases were dismissed by U.S. District Court judges after the suits were ordered to be heard in federal court rather than state court, where they were initially filed. Given these recent developments, it’s safe to say that the nationwide climate litigation campaign is not going exactly as planned. But while this isn’t the outcome activists are seeking, it’s possible that it’s still the outcome they expected. The recent case dismissals call into question the future of the other pending lawsuits. As Amy Harder of Axios recently pointed out, three additional pending lawsuits, filed in Washington State, Colorado and Rhode Island, have recently been punted from state to federal court—following the same track as the New York City and San Francisco and Oakland cases. To the casual observer, the question of which court will hear which case may seem like an uninteresting procedural development. But in reality, this move has wide-reaching implications for the broader legal campaign against the fossil fuel industry, as we are seeing today. So why is the court venue important? As a refresher, a mix of several cities, counties and states—all but one of which are located on the coasts –are suing a variety of energy companies for damages related to climate change. The issue with these lawsuits (other than the fact that their legal logic is dubious at best), is that the language incorporated in each complaint was crafted under the impression that these cases would be heard in state court. WASHINGTON – Two days after President Donald Trump’s controversial summit with Russian President Vladimir Putin, some Senate Republicans are looking to hit Russia where it hurts – it’s energy sector. Sen. John Barrasso, R-Wyo., introduced legislation Wednesday calling for the Department of Energy to speed up approval of LNG exports to Europe, where Russia has long had a strangle hold on natural gas supplies. Likewise, the bill would authorize U.S. sanctions on Russian energy projects, including the planned Nordstream 2 pipeline, which would run across the Baltic Sea from Russia to Germany. With Republicans anxious to prove their anti-Russian bonafides, Congress is expected to consider in the weeks ahead numerous pieces of legislation designed to punish Russia for its meddling in the 2016 presidential election. That follows a summit in Helsinki Monday in which Trump, standing alongside Putin, said the Russian president had made a “strong and powerful” case that his country had not interfered in the election. He also questioned unanimous consensus among U.S. intelligence officials that Russia had in fact interfered – a statement the president attempted to walk back Tuesday. Malcolm Turnbull is winning over voters with his claims the government will force down power prices, with a special Newspoll showing the Coalition ahead of Labor as the most trusted party to deliver lower priced and more reliable power. However, support for Australia to pull out of the Paris climate change agreement is also hardening as the electorate becomes increasingly concerned about energy costs, with almost two thirds ranking it ahead of emissions reduction as a priority for government. The poll on energy prices and climate change, conducted for The Australian between July 12 and 15, shows a majority of voters backed the government over Labor on managing energy. The poll, showing the Coalition leading 40 per cent to 34 per cent, marks an eight-point turnaround in voter sentiment since May when a shock Newspoll showed more people believed Labor would be better at managing Australia’s energy supply and power prices than the Coalition. The May poll was used in a Coalition party room stoush to run down the government’s national energy guarantee and label it electoral poison because of the perception it was pro-renewable. Energy Minister Josh Frydenberg has since argued that the government’s efforts had forced wholesale power prices down by 25 per cent over the past year with retail prices also starting to show downward movement. The latest poll shows Labor, Greens and One Nation voters being won over to the government’s argument rather than sceptical Coalition voters. Labor voters’ support for the government rose two points to 11 per cent while support for Mr Shorten fell from 73 per cent to 69 per cent. Among Greens voters there was a five-point rise to 20 per cent in backing for Mr Turnbull over the issue. The government’s ability to win over One Nation voters has been significant, with a lift of 12 points to 42 per cent in support for the Coalition’s efforts, compared to 23 per cent for Labor. Tony Abbott recently upped the ante in his rhetoric against Mr Turnbull’s energy policy stance, claiming it was about time Australia followed Donald Trump’s lead and pulled out of the Paris Agreement on climate change targets, which he had signed up to as prime minister. Support for Mr Abbott’s position has grown since October last year with a three-point rise to 48 per cent of voters claiming to be in favour of withdrawal if it led to lower power prices. Surprisingly a quarter of Greens voters and 37 per cent of Labor voters believed that cheaper power prices were more important than the climate change agreement to reduce emissions and were in favour of withdrawing. The anticipated slowdown would mark the first time the solar market has shrunk. It comes after China announced in late May it was curbing utility-scale development in the world’s biggest market, pulling the plug on about 20 gigawatts of projects. That will reduce global installations to 75 gigawatts, down from 99 gigawatts in 2017, Lee said in an email. “Lowering our coverage view to cautious, we believe oversupply is set to continue in the near-to-medium term as demand from the largest solar markets remains tepid,” Lee wrote in the research note. JinkoSolar Holding Co., the world’s largest panel maker, fell as much as 3.2 percent, the most intraday in a week. The Bloomberg Intelligence Global Large Solar index declined as much as 2.1 percent. 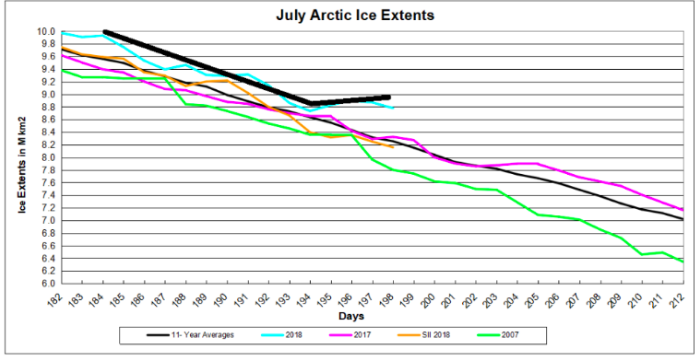 The graph below shows how the Arctic extent has faired in July compared to the 11 year average and to some years of interest.Note that 2018 started July well above the 11 year average and other recent years. As of day 195 (yesterday) ice extent is still greater than average and the years 2007 and 2017. SII 2018 is tracking well below MASIE this month, a gap of 500k km2 at this point.